Many of the victims in the coal-mining city of Kemerovo were children. Russia's Investigative Committee spoke of blocked exits and "serious violations" at the Winter Cherry mall. Ten people are still listed as missing. Local teachers are trying to trace their pupils, who were on holiday. They do not know how many were in the complex. 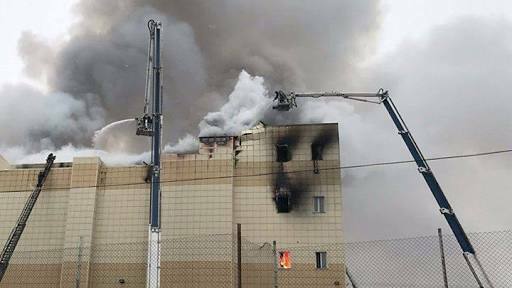 In a Facebook post (in Russian), Kemerovo politician Anton Gorelkin said that "fire exits were shut, turning the complex into a trap" and "there was no organised evacuation". He also said a fire extinguisher that could have doused the flames at the start did not work. Russian media said most of the roof had collapsed. The fire engulfed a children's trampoline room and a cinema on the fourth floor. Firefighters said the building was still smouldering a day later, with smoke billowing out and the remaining structures at risk of collapse.